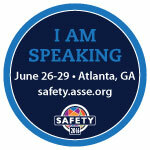 Now that the CSP Beast has been conquered, I'm making my plans for #Safety2016 in Atlanta. Safety 2016 is the professional development conference and exhibition for the American Society of Safety Engineers (ASSE). Attend the ASSE Council on Practices and Standards as the Industrial Hygiene Practice Specialty proxy. Attend the ASSE House of Delegates as the Industrial Hygiene Practice Specialty proxy. Attend ASSE Region II party! Session 543: Revolutionizing Risk Assessments - Oh My, Oh My, Bowties! Session #769 is highlighted and underlined because I am co-presenting this session with Dr. Ilise Feitshans. We have an engaging presentation planned that will discuss the concept of gender equity and how it can be integrated into occupational safety and health programs. Our session is being sponsored by Chubb (thank you! ), the Women in Safety Engineering (WISE) Common Interest Group (thank you! ), and the Industrial Hygiene Practice Specialty (thank you!). Piper Pangolin is also coming to the conference, and we'll be roaming the expo hall for more interesting things to showcase in our Safety 2016 recap video. Last year's recap video was fun to make and will show you what to expect at Safety 2016. A PPE vending machine at Safety 2015.